Bloody hell – my body aches, and it all has to do with rusty nuts. Not those rusty nuts. These rusty nuts…the Rusty Nuts Grand Challenge – 1,000 miles in 24 hours on a motorbike – scheduled in my calendar for the last weekend in October. I, this weekend, chose the latter. Likewise – don’t ride 1,000 miles six weeks before you ride 1,000 miles. OK then. How about 809.7 km? I planned a route a few months ago and was waiting for a day off from the family so I could do it. 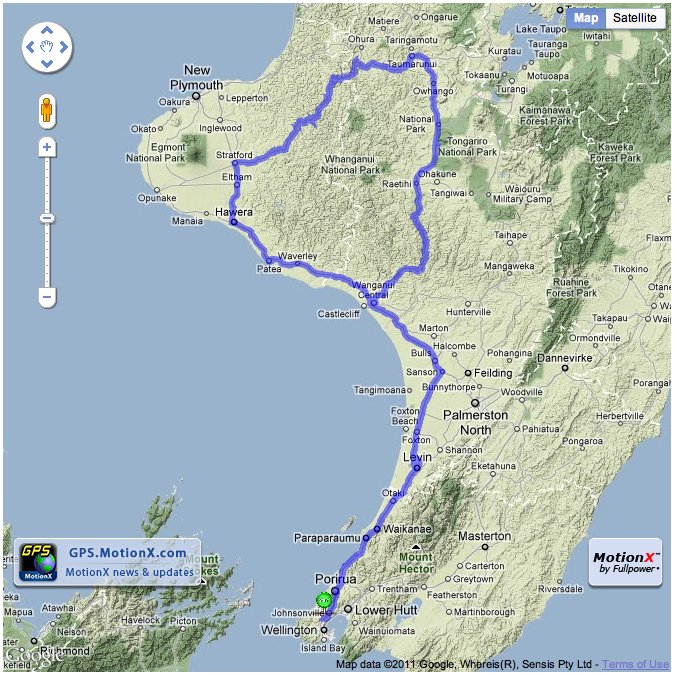 I was going to ride from Wellington to Stratford (Taranaki) and then take the Forgotten World Highway inland to Tauramanui, then down through Raetihi back to Wanganui, and back home to Wellington. Google maps reckoned 10 hours 41 minutes. Sunday (today) was the day. I checked the weather each day leading up to the ‘ride’. It wasn’t looking great. But then I thought – man up! It might be crap on the day of the Grand Challenge, and I’m going to have to deal with it. So I did. I watched Argentina nearly beat the British, and went to bed a little nervous of the day ahead. Too nervous obviously. I woke at 4.00am and couldn’t get back to sleep. I tossed and turned for another 30 minutes. Bloody hell – why don’t I just get up and go. I may as well be awake on my motorbike than awake in bed where I can do no good. So, I got up, had a quick breakfast, pulled on my gear, set the GPS to track my route and headed North into a very dark, but still, morning. Hitting the straights at Te Horo into Otaki – the sunset was stupendous – the reddest morning sky I have seen in a long time – mainly because I haven’t been up at 5.30am recently. It’s wonderful how the horizon looks so sharp against a red sky. I wanted everyone to be up to experience this, but I was nearly all alone on the road. Great riding conditions – no traffic, no wind. Nothing more to say for quite a while – just me and the road. I have a vague recollection of re-fueling at Hawera in the Taranaki. I do remember removing my balaclava and helmet and going in to pay, then being surprised by the girl behind the counter. She had a very, very deep voice. I swear, if my eyes had have been closed she could have been Barry White. She also had the remnants of a passionate encounter, perhaps in the back of a car, with an amorous local – three day old hickeys on her neck. I’m only guessing (or hoping) that it was amorous. By the time I reached Eltham (around 8.00am), the rain had started. And it came down in buckets. I pulled over to put on an extra layer of wool (I was shivering) and my rain suit and over gloves. Got my stuff sorted and then carried on. Stratford came pretty quickly. The locals were up and about getting their Sunday papers, milk and bread. The turn-off to the Forgotten World Highway was easy to find – I think it was the second roundabout. From here the road became more narrow and winding. Whangamomona was about 65kms away. I was hoping to get something to eat there, as the Hotel is owned by an old classmate of mine from college days and it comes highly recommended. Already though I was worried that I might arrive too early. The Forgotten World Highway is a fabulous road. Obviously steeped in history judging by the number of historic place signs, but given that I was on a training run I couldn’t stop, or take photos. If you want the tourist photos and commentary go take a look here. I pulled into Whangamomona at 9.50am. The hotel was shut. Bugger. I could have stopped and knocked on the door but it would have wrecked my schedule. I pressed on. The road goes over several saddles. The second (I think) led to Whangamomona. Another, maybe 30kms further on culminated in a 15om long tunnel, hewn from the rock and supported overhead by wooden bracing. Stunning. Further down the road I got to practice my Charlie Boorman and Ewan McGregor riding skills by standing up on the footpegs and riding the 15km of unsealed road through beautiful native bush. It’s still raining, and quite slushy, but I’m perfectly comfortable. Tauramanui arrived. 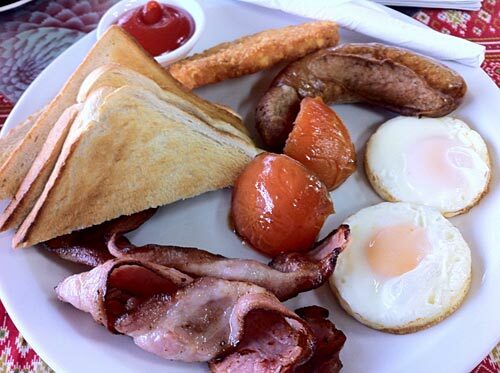 I stopped for my first bite to eat – a full breakfast of sausage, bacon, eggs, tomato, hash brown and toast. Plus the biggest flat white known to mankind. They like value for money in Taumaranui. I re-fueled further down the road and had a nice chat to a truckie, on his day off, who wanted to know about my Revit rain gear. He had done the RN Grand Challenge three times previously so he could appreciate my enthusiasm for a long Sunday ride. I’ve only ridden through National Park twice – today, and on the Grand Challenge last year. Both times the weather was atrocious. High winds, and driving rain. Miserable and often quite terrifying when I picked the wrong line and the rear wheel hit that shiny tarmac. But I pressed on. 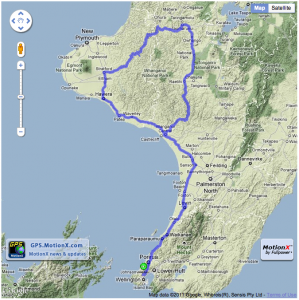 The road through to Wanganui has been improved over the last 12 months – it was pleasant riding. The rain had gone but the road was still wet, and slippery. So I took it easy. Made it to Sanson and stopped to stretch my legs and have an icecream. The road along the Foxton Straights was real busy, but I had the wind behind me, so it was pleasant riding. Made it all the way to Paraparaumu before I needed more fuel. I was on the home stretch. one short stop for an ice-cream.